Small Ruminant Research 35:133-139. 2000. Interactions between dietary protein and energy levels with ad libitum feed intake in effects on cashmere fiber growth have not yet been extensively investigated. 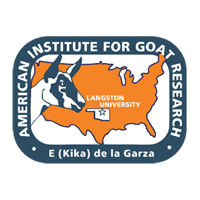 Thus, the objective of this experiment was to evaluate the effects and interactions of ad libitum consumption of diets differing in crude protein and metabolizable energy concentrations on growth and cashmere fiber production by young/growing US Spanish wether goats. Thirty-six Spanish goat wethers (averaging 196 days of age and 17.5 kg body weight at experiment initiation) from a herd previously selected for cashmere growth were used to determine effects and interactions of ad libitum consumption of diets differing in concentration of crude protein (10 and 15%) and metabolizable energy (2.00, 2.35, and 2.70 Mcal/kg; dry matter basis) on growth and cashmere fiber production in an 84-day fall-season experiment. With growing Spanish wethers in the fall season and ad libitum consumption of diets approximately 40, 60, and 80% concentrate, corresponding to 2.00, 2.35, and 2.70 Mcal/kg of metabolizable energy, respectively, cashmere fiber diameter was greater for 15 versus 10% dietary crude protein regardless of metabolizable energy level. Diet composition did not impact cashmere fiber length. Dietary concentrations of crude protein and metabolizable energy did not alter guard hair weight but interacted in weight of cashmere fiber. However, similar numerical differences, although of lesser magnitude, among treatments in pre-experiment cashmere fiber weight existed, suggesting need for further experimentation with greater animal numbers and(or) treatment allotment based on animal differences in most important variables.